A former thief, Will Montgomery (Nicolas Cage), is released from prison for a bank robbery of $10 million. He decides to visit his estranged daughter, Alison, whom he hasn't seen in eight years. 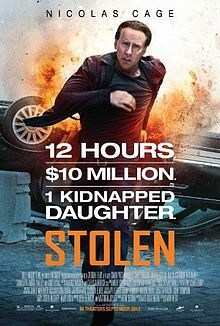 But then an old partner (Josh Lucas), who many believed to have died, kidnaps Alison and locks her in the trunk of his medallion taxi cab, and demands ransom: the $10 million he believes Will still has. Since he doesn't, Will has to rob another bank as the detective that put him away (Danny Huston) tracks him down again. The story-line is predictable and lame, nothing new here. Nicolas Cage looked old and tired… probably tired of trying to be a hero again. Unlike the hero saving a damsel in distress (daughter, in this instance) like Taken or 24 (similar story-lines), he seemed ‘unbelievable’ as Will. He somehow lacked oomph while trying to save his daughter, even when ‘boiling’ all those gold bars in the bank vault. So sorry Nicolas Cage’s fans, for this attack *innocent look* Anyhow, I've always preferred him in Ghost Rider or The Sorcerer's Apprentice.